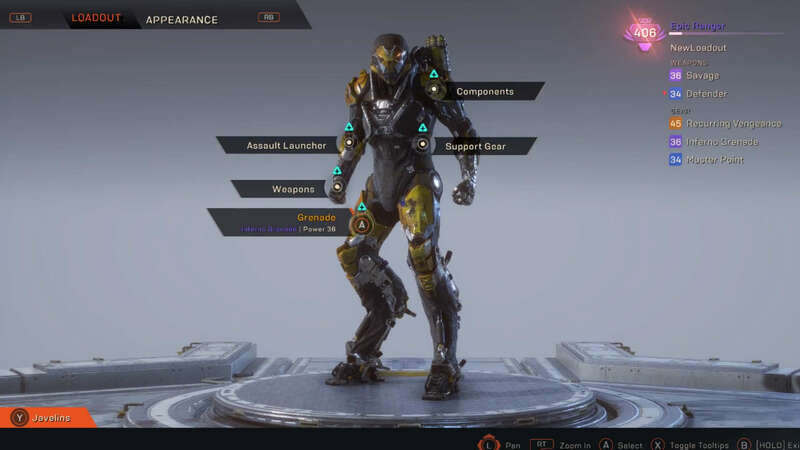 The Anthem Forge is where you’ll customise your Javelin, so you should master its intricacies to get the most out of BioWare’s mech game. While each of the four Anthem Javelin classes – Colossus, Storm, Ranger, and Interceptor – have clear roles, there’s a huge amount of flexibility when you start customising them. This is where the Anthem Forge comes in. From the story mode to the Anthem endgame, you’ll spend a lot of time in this lovely collection of menus. Yes, the Forge is where you can choose a shiny coat of paint to slather all over your mech and which emote to parade over the corpse of your recently-dispatched foes, but it’s also where you’ll choose your loadout, optimising your build to take down the game’s biggest baddies. While the Interceptor might be known for its agility, and the Storm its ethereal elemental energy, the Forge will help you push these suits beyond the four starting archetypes. There’s a lot to get your head around, so here’s a primer on how to get the best out of your battlesuit in the Anthem Forge. The Forge is where you’ll be customising your Javelin. To access it from the Anthem Fort Tarsis single-player hub, speak to vendor Zoe. You can spot her on the other side of the courtyard from the big ol’ door and through the dense collection of market stalls. She’s in the yellow top just in front of the platform where your metal suit proudly stands. Depending on your progress in the story she might have some binary decisions for you to make, but you’ll be able to access the Anthem Forge once that’s all done. That said, you do have the option to skip this step entirely after finishing an expedition so you can go straight to the Forge. By clicking on the component you’re keen to change, you’ll see all the potential replacements you have available in your inventory. When choosing what to fit to your Javelin it’s important to pay attention to rarity and inscriptions. The rarity scales from Common, Uncommon, Rare, Epic, and Masterwork to Legendary, coloured grey, green, blue, purple, orange, and yellow, respectively. Naturally, rarer components are more powerful, but rarity also dictates how many inscriptions they have. Inscriptions act as passive perks so they can significantly change how a component operates. Uncommon gear has one only one inscription, but legendaries have five. Thus, the rare the item, the more chances you have to tweak your build and create your perfect loadout. Inscriptions can boost your shield recharge rate, for instance, or buff your secondary ability when an enemy has been primed for a combo move. By combining rare components you can completely change a Javelin’s behaviour, making the slow tanky Colossus, a nippy battlesuit with a large fuel tank for flying. Well, nippy-er. A component’s inscriptions are randomised, so if you are trying to assemble a build with very specific passive buffs you might need to resort to the Anthem crafting system. In Anthem you can find templates for Javelin components that allow you to transform materials you find in the world and receive from scrapping unwanted gear into new components. When you craft a component it’s randomly assigned inscriptions and, if you’re lucky, they’re the ones you want. If not, there’s nothing stopping you from trying again – so long as you have the materials to make it. Each piece of gear has a power level attached – much like in Destiny 2. Your Javelin’s overall stat is the combined score of all its components’ power levels. The higher the level, the rarer your exo. Some activities are gated by power level, so this impacts the types of missions you can access. 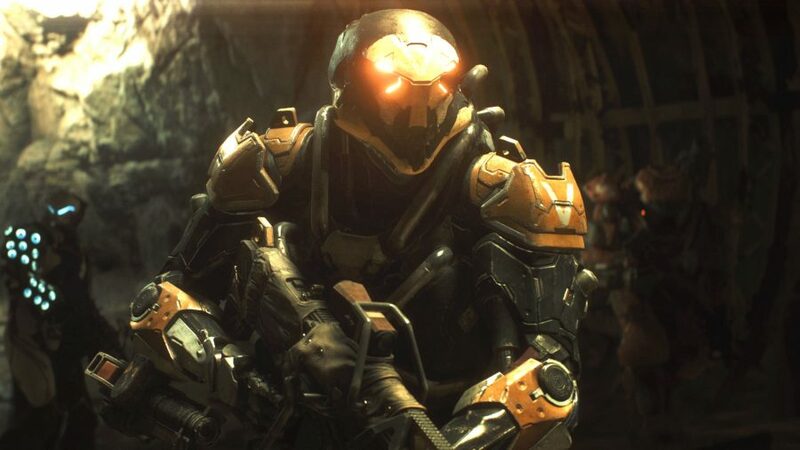 So, the best way to increase your Javelin’s capabilities and rarity, and take part in the later parts of the game, is by completing tougher missions, such as Anthem Strongholds, on as high a difficulty as you can manage. That way you have a higher chance of getting more powerful pickups. So that’s all you need to know about the Anthem Forge. If you’re looking for more PC games like this, make sure you check out the other co-op games that are best experienced with your mates. However, if you’ve come to Anthem hoping for another Mass Effect, let the other best RPGs on PC soothe your story-craving sensibilities. For now, we look forward to seeing your Javelin in action, Freelancer.